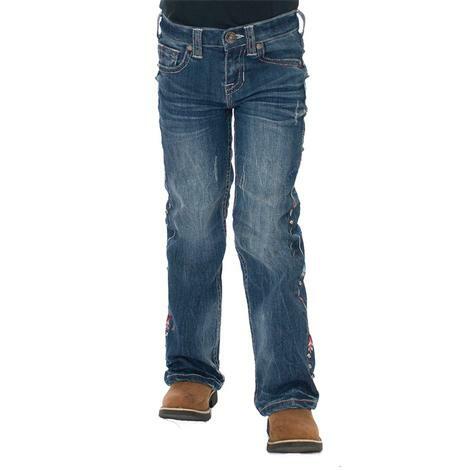 These jeans by Cowgirl Tuff have a nice medium wash denim with a natural fit waist and slim fit through the thigh and seat. Boot cut. 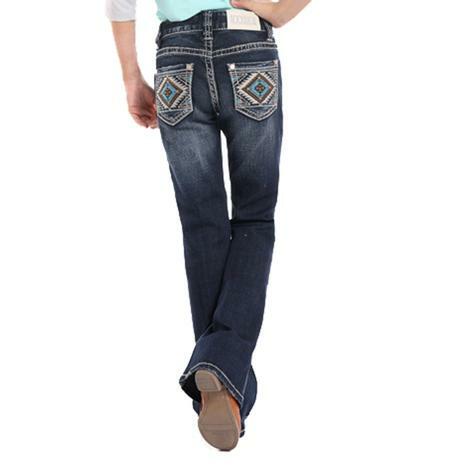 These dark wash Rock and Roll Cowgirl jeans have multi-colored embroidered Aztec back pockets. All the pockets are functional. 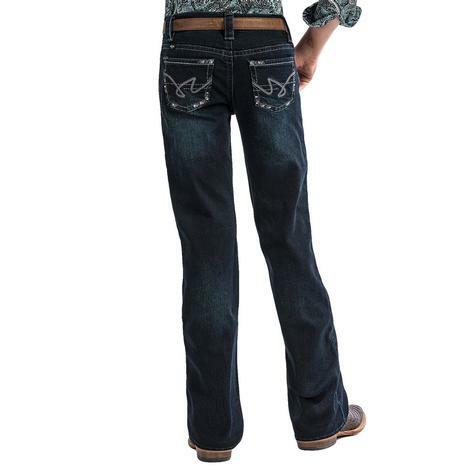 Cowgirl Tuff's dark wash, boot cut jeans feature whiskering, 5 pocket styling,barbed embroidery on back pockets. Made from 98% cotton and 2% spandex. 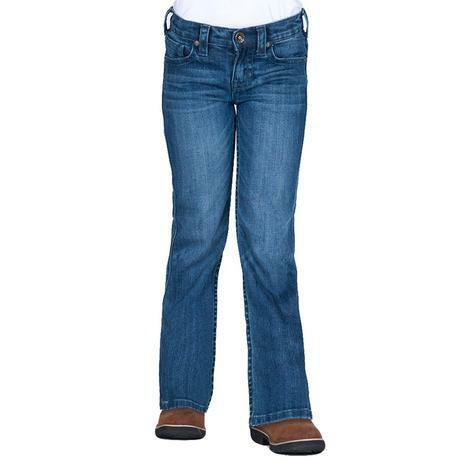 These Lucy jeans by Cruel Girl will bring out her cowgirl side! 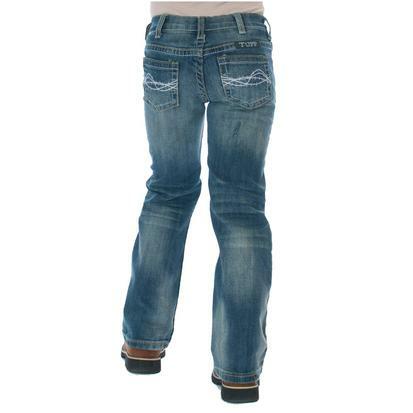 These jeans feature hand sanding and whiskers and a dark rinse wash and a regular fit. The mid-rise waist makes for total comfort for in the saddle or playing with friends. 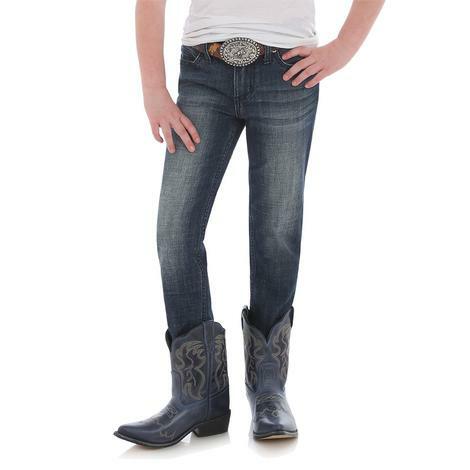 They have a button closure with a bootcut leg opening. You won't wanna mess with this cowgirl! 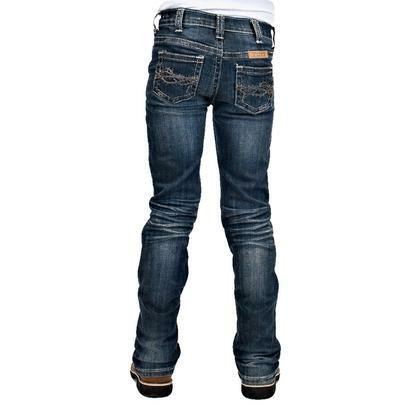 These jeans by Cruel Girl feature a dark wash finish and hand sanding with whiskers. 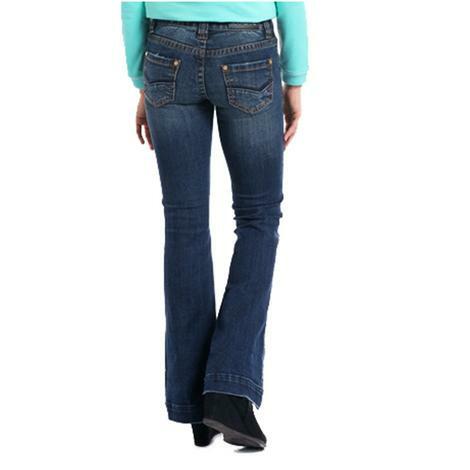 This style is a slim bootcut that is going to look great with her boots. 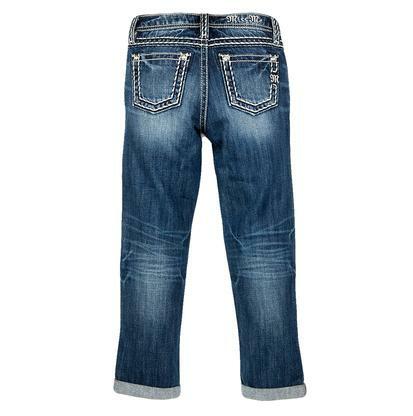 If your little cowgirl is in need of some luck put her in these medium wash bootcut jeans by Cowgirl Tuff. They feature turquoise and purple mixed stitching, light distressing, light whiskering, and a lucky horseshoe pocket embroidery with studs. 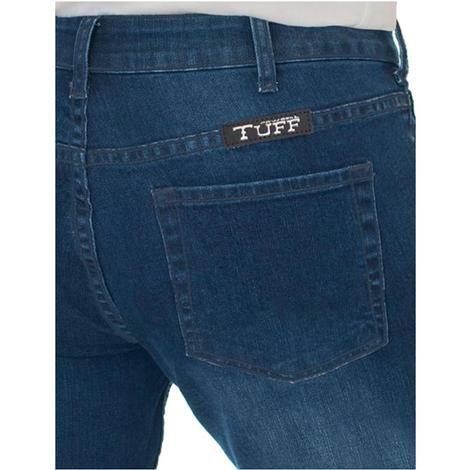 Cowgirl Tuff was founded with a mission to encourage and inspire, and what better way to do so than give a girl Brave Wings with her jeans. This beautiful pair of pants features embroidered turquoise, white, and red feathers down the legs with brass studs in between. 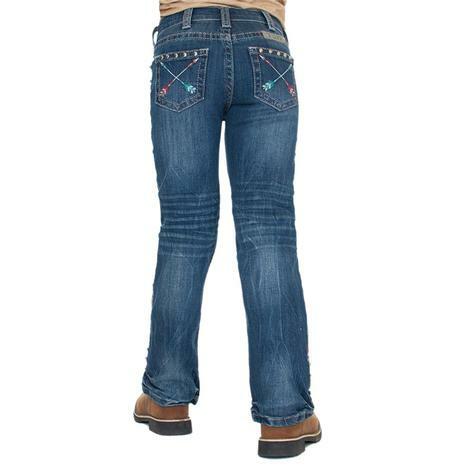 The pockets are also embroidered with the signature barbed wire in red and turquoise with studs along the tops. Cowgirl Tuff Girls Pathmaker Jeans are a medium wash jean with red, white, and turquoise studded arrow stitching on the back pockets and down the sides. 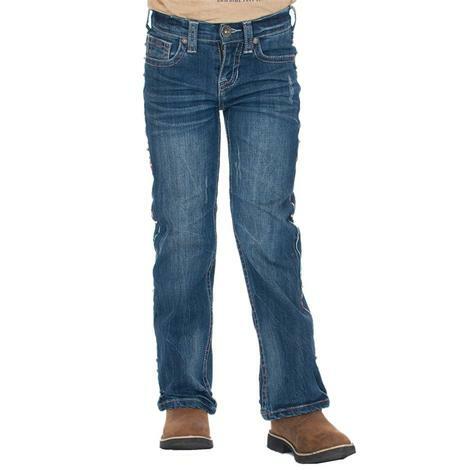 The denim is lightly distressed with heavy whiskering. These are a Cowgirl Tuff classic! 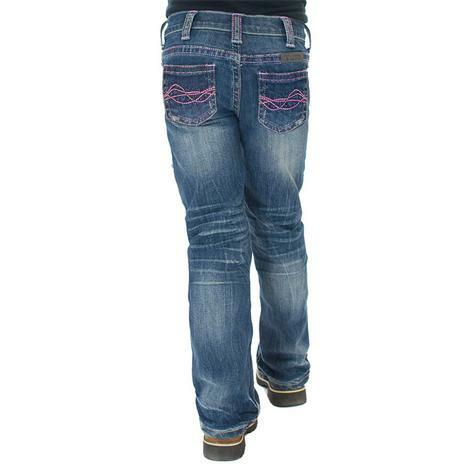 These bright Cowgirl Tuff Girls Aztec Jeans feature pink, purple, and turquoise stitching on the pockets, zipper, and outer seams. 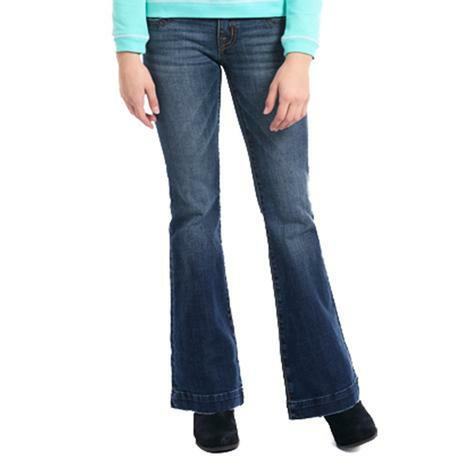 The right leg has bold embroidered Aztex graphics in gorgeous, bright colors. The lower left leg has more beautiful Aztec embroidering with the Cowgirl Tuff inspirational motto "Never Give Up" stitched around the bottom cuff. 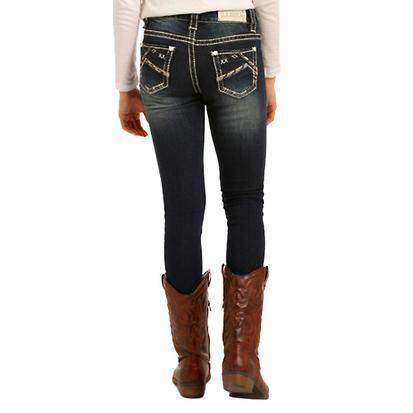 These jeans are absolutely stunning and will surely be your cowgirl's favorite pair of pants! 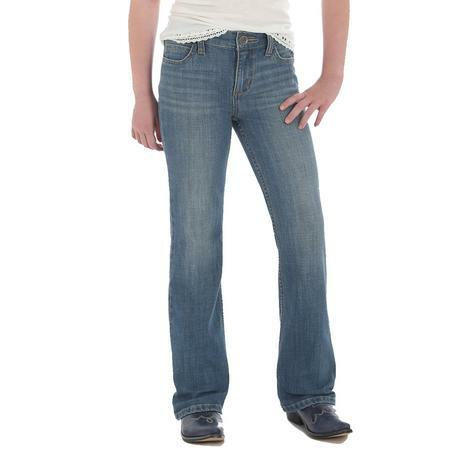 These jeans are a comfortable fit with a modern style straight leg by Wrangler. 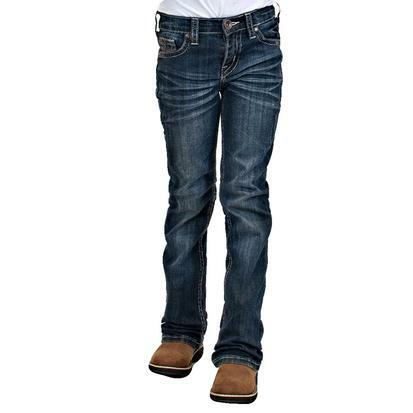 Give your girl the cowgirl jeans she has been wanting, They will feel comfortable in the saddle or at the park. 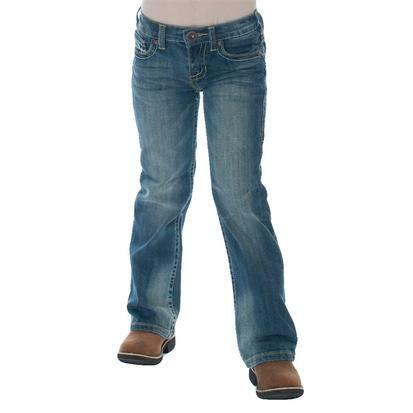 These jeans are perfect for your little cowgirl and have just the right amount of stretch! Features include functional pockets and fading/whiskering throughout. 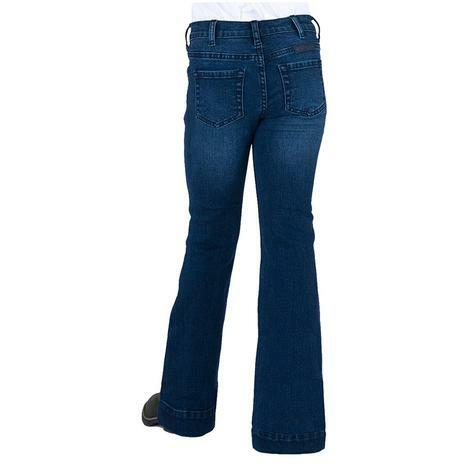 These trousers by Rock and Roll Cowgirl has a dark vintage wash and low rise waist. 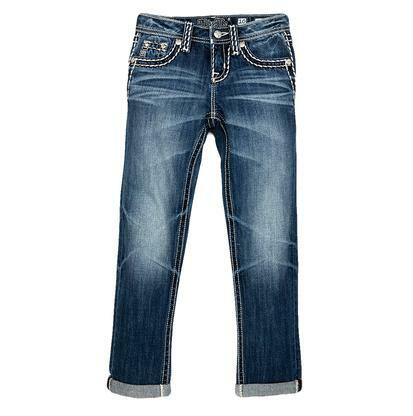 They have just the right amount of stretch for a comfortable fit every time you put them on. Boot cut. 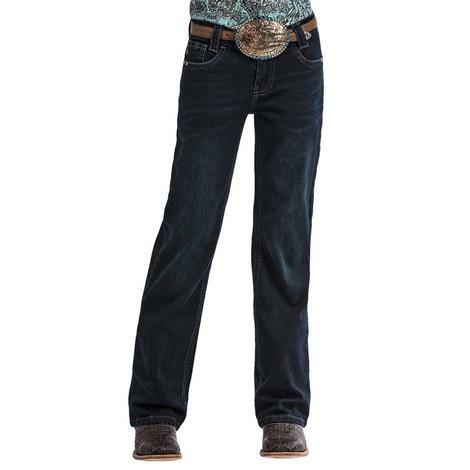 The dark color makes these jeans by Rock & Roll Cowgirl perfect for semi-formal occasions and the skinny style will look great when she tucks them into her favorite boots. This is the perfect for any occasion. 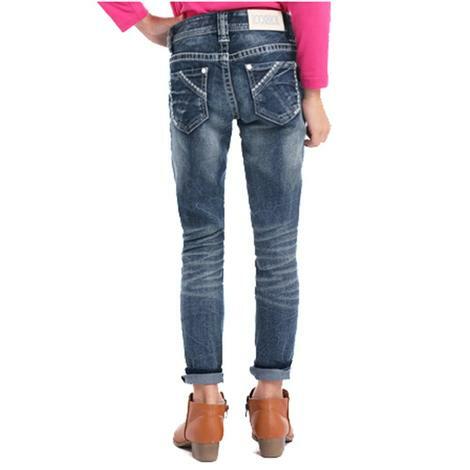 These Girls' Boyfriend Ankle Cuff Jeans by Miss Me are made from denim that's constructed from 100% cotton. These feature bold ivory contrast stitching. 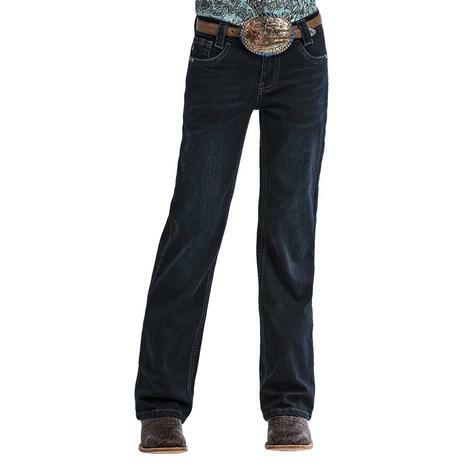 This Cowgirl Tuff dark wash back, boot cut jeans feature whiskering, 5 pocket styling, and tri-color barbed embroidery on back pockets. Made from 98% cotton and 2% spandex.